I wanted a simple, little project that I could do sort of mindlessly while watching tv and these handwarmers were just the ticket. They come together in just a couple of evenings and you can have fun with whatever color palette you want. It’s a great stash buster. I kept mine to four colors, but would have really liked to have one more light grey after the white for a more gradual increase. 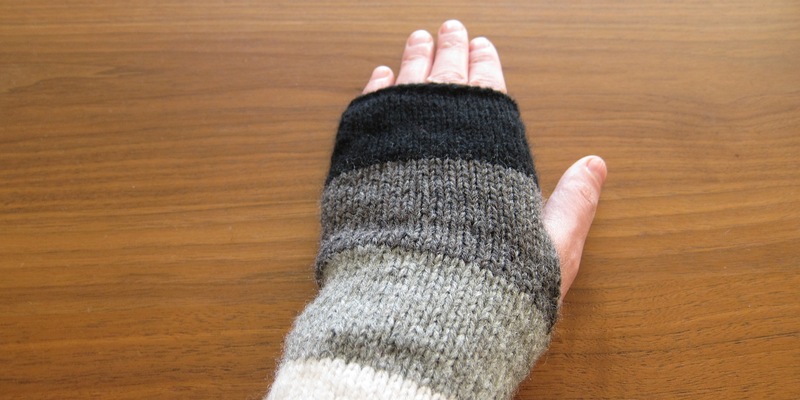 If you decided to add a fifth color, knit each one just over 1.5 inches instead of the 2 used in the pattern. 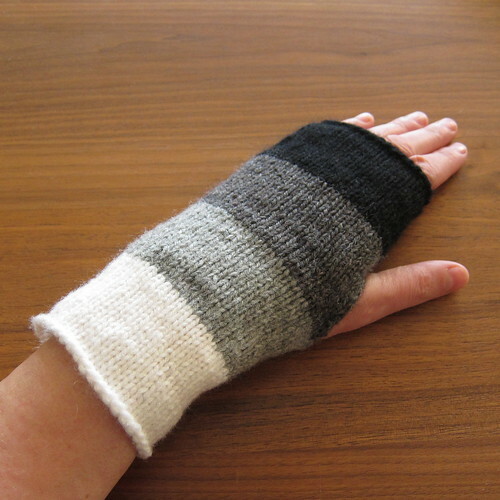 Or do each one 2 inches and have three colors before the thumbhole for a longer cuff. Now that I’ve knit these up, I have an idea for a pair of ombré mittens bouncing around in my head…time to hit the yarn shop. worsted weight yarn in four colors (or more if you wish, but I’ll give color change instructions for four). This is a good scrap project, I think I used less than 1/4 a ball of each color. Cast on 42 stitches in the lightest color. Divide between three needles. Join together to knit in the round being careful not to twist. Place a stitch marker between the last and first stitch. Knit 2 inches in the lightest color. Change to the next darkest color. Knit one round. On the first stitch of the next round pick up the light colored stitch from the row before and knit it with the next stitch on the needle. This will give you a jogless stripe. Continue knitting until you have 2 inches in that color. Change to the darkest color. Knit one round. On the first stitch of the next round pick up the light colored stitch from the row before and knit it with the next stitch on the needle. Knit for 1.5 inches. Next round: k2tog, k19, k2tog, k19 (40 stitches). Next round: k2tog, k18, k2tog, k18 (38 stitches). Knit until that color is 2 inches long. Note: The cuff on these is not tight to the wrist. 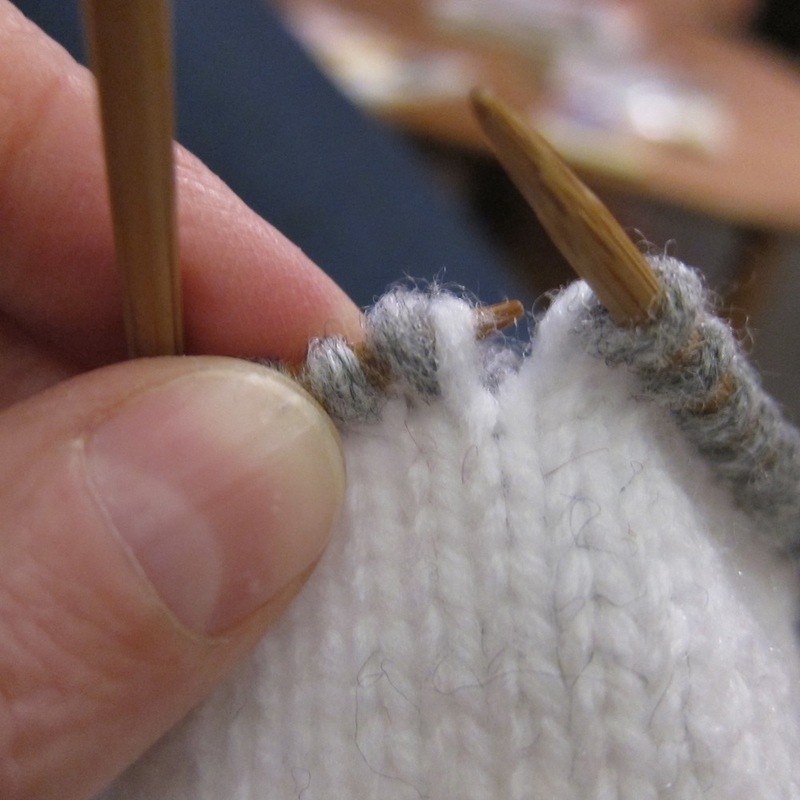 If you want it tighter, cast on a few less stitches and then increase up to the amount needed right before the thumb. Could you do this on circular needles instead of the 4 double pointed ones? 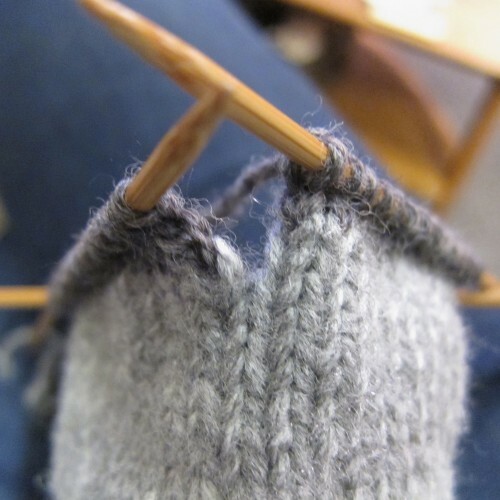 You could do magic loop on circulars or use two circulars. Just remember you need to be able to knit a circle that is as small as your wrist.